Yes we had an excellent trip with some very good fishing…i have lots of photos and will sent some of the better ones through. 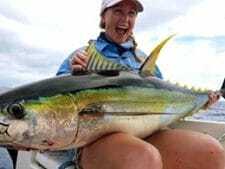 We got a lot of Wahoo,Yellow Fin and did hook 2 Marlin…first one took about 900m of line in the first run then jumped and broke the 24kg mono…2nd fish also took about 600-700 metres of line in the first run …i fought it for 2.48 hours up to the boat..Andrea estimated it at 280-300kg and 3.5 metres long .It broke the 400lb leader right at the boat whilst Andrea was wresting it for the 2nd time .No time to tag it but i was very happy to get him to the boat and to have got a quick glimpse of the fish. 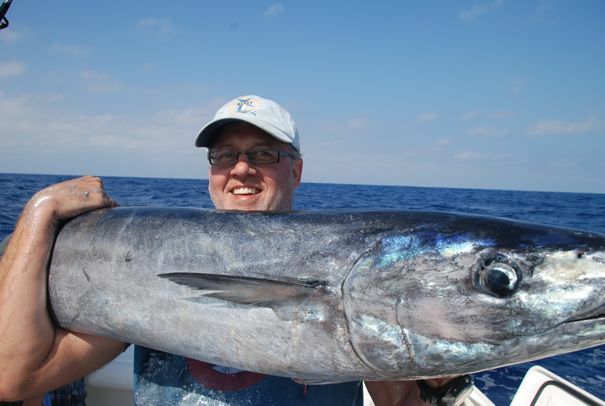 Having fished with many guides all over the world including Broome,British Columbia and Cabo in the last few months he was best by a fair margin.The boat is immaculate,the gear first class and Andrea knows the waters as only a 5th generation local would. I’m going to book him again for next year. 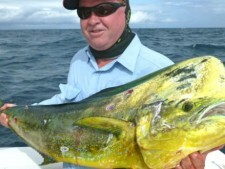 Fantastic trip with 5 star, fishing, crew, accommodation and meals. An excellent way to kick off one of the “bucket list” items. Sensational way to spend a week. We will definitely return. Amazing fishing, food and staff. Jeanine is amazing. We will be back. Marine Fishes: Blue Fish, Red Fish, Who Fish?